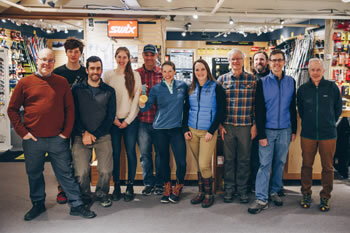 On Wednesday, March 20, 2019, Skirack and the Sleepy Hollow Inn Bike and Ski Center had the honor of hosting one of the most inspirational and influential nordic skiers of our time. It was a perfect, blue bird day. The snow was soft and the sun was shining when I arrived at Sleepy Hollow to set up for what promised to be an exciting event. People were already materializing with an hour still to go before the start. You could feel the anticipation building as everyone eagerly waited for the Fischer SUV to appear. I busied myself setting up tables and erecting wind blades that proudly proclaimed Fischer and One Way. 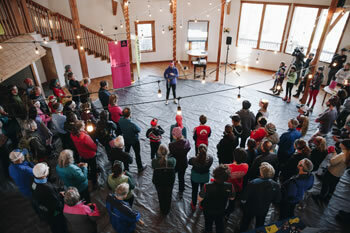 When next I looked out the window of the barn, there it was, shining black in the sun, and as I scanned the scene I finally spotted her: Kikkan Randall, winningest American Nordic Skier, Olympic Gold Medalist and determined cancer fighter. Kikkan Randall has had an amazing career, even before she achieved international recognition for her role in the Gold Medal effort in the Team Sprint at the 2018 Pyeongchang Winter Olympics. She was the first American woman to break the top ten in a World Cup event. The first to win a World Cup and the first to win the World Cup Overall Sprint title, which she would go on to win a total of three times. Her talent and determination paved the way for the incredible prowess of our current US women’s national team. Along the way, she has made an effort to give back to her community and has worked hard to encourage young girls to become lifelong athletes, break down barriers and reach for things no one thought possible. Growing up as a competitive nordic skier in Alaska nine years behind Kikkan, I had the privilege of watching the beginnings of her international career at the end of my elementary school years, even watching her Olympic debut in person at the 2002 Salt Lake City Olympics. She was the hero of my teenage years and when my older sister, Becca, graduated from high school and moved to Anchorage to ski with the APU Nordic Ski Center I was floored to realize she would be teammates with Kikkan. Over the years I have been able to spend some time with Kikkan as a result of being her teammate’s sister. When I was competing for the University of Vermont I worked as an athlete ambassador at one of the first US Fast and Female events at US Nationals in Maine alongside Kikkan, Becca and my awesome teammates. I remember crying from happiness when Kikkan won that first crystal globe in 2012. I was, and still am, so proud to know someone who has inspired two generations of young female athletes. Needless to say I was very excited when I found out that she would be coming to Vermont to ski with and meet the local community. The wind blades secured, I went down to the Skirack van to grab my ski clothing and get ready to participate in the ‘ski with Kikkan’ portion of the afternoon. She had managed to slip away from the excited community members to change as well. After a brief wait while more and more people arrived and milled about on their skis, Kikkan reappeared and the event officially got underway. She skied off down the trail with a parade of skiers ranging from babies in backpacks to racers to pleasure skiers following behind. After a lap of the snowmaking loop, we gathered in the stadium where Kikkan taught us all to do proper sprint starts and lunges. It was crowded scene full of laughs and the occasional fall. Several more laps of the snowmaking loop were completed, then it was time for everyone to assemble in the barn, where we were taking donations for Aktiv Against Cancer, an organization that works with cancer patients and care providers to spread the message that staying active through treatment helps reduce side effects, increases strength, and improves mental health. Thanks to our amazing local nordic community, we raised nearly $1,000! Kikkan appeared with her gold medal in tow and proceeded to give one of the most intimate, engaging and honest talks I’ve heard. She walked us through the ups and downs of her career, sharing laughs and tears. Her grit and natural optimism shone as she regaled us with the incredible whirlwind that was 2018. The ultimate high of winning the United State’s first cross country skiing Olympic gold medal, then being diagnosed with breast cancer a mere few weeks later. It was striking to hear firsthand how much Kikkan's twenty years of training and racing at the highest level played into how she attacked her cancer treatment. The commitment to her fans and others struggling through treatment was evident when she allowed us to participate in her journey through daily video posts. Resounding applause echoed through the barn at Sleepy Hollow when she finished speaking and line formed as everyone waited their turn for an autograph and a word with Kikkan. The barn slowly emptied and I was finally able to have a moment to say hi. Kikkan was a bit surprised to see me there, and we chatted about Vermont and the races she and my sister had just come back from in China. It was good to catch up and see her looking so healthy, strong and happy. As I sit now and think back, I am delighted to have been able to facilitate the success of her visit and to see the effect of her experience on the faces of the young racers present. 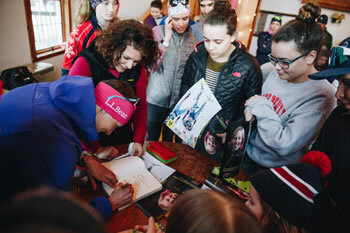 It was a whirlwind of an afternoon and I am proud of the contributions raised for Aktiv Against Cancer and to have the local ski community meet one of the most inspirational people I know.